(U) To discuss the current status and capabilities of the 505th and 506th ING BNs. (U) To discover how the Fallujah Insurgency threatened and „beheaded‟ the leadership of these two BNs causing mass desertions from the two units. (U) To inform deploying units on AIFs methods of influencing the allegiance of Iraqi Security Forces (ISFs) personnel. (U/FOUO) AIFs kidnapped the Commanders (CDRs) of the 505th and 506th ING BNs on 9 Aug 04. 505th CDR is still missing and the 506th CDR was beheaded. (U/FOUO) The Fallujah Insurgency, with personnel from the Fallujah Police and the Fallujah Brigade, kidnapped these two CDRs. (U/FOUO) AIFs in Fallujah used threats, intimidation and tribal ties to subvert the allegiance of these two ING BNs. 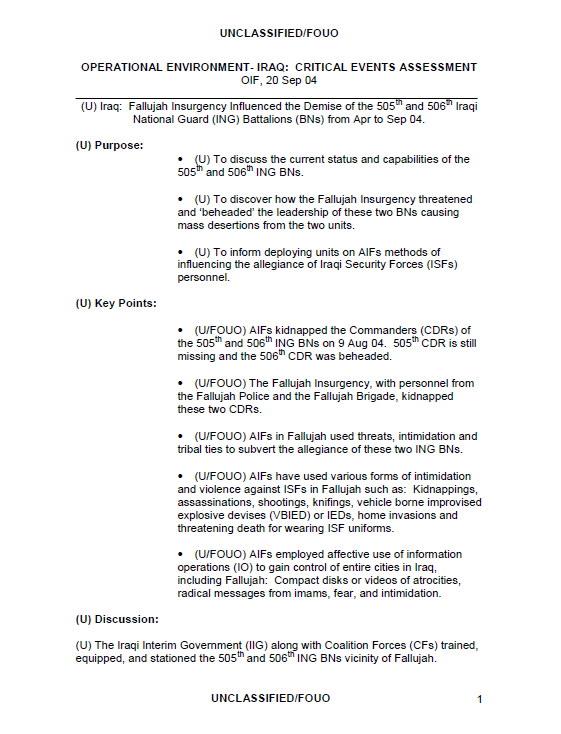 (U/FOUO) AIFs have used various forms of intimidation and violence against ISFs in Fallujah such as: Kidnappings, assassinations, shootings, knifings, vehicle borne improvised explosive devises (VBIED) or IEDs, home invasions and threatening death for wearing ISF uniforms. (U/FOUO) AIFs employed affective use of information operations (IO) to gain control of entire cities in Iraq, including Fallujah: Compact disks or videos of atrocities, radical messages from imams, fear, and intimidation. (U) The Iraqi Interim Government (IIG) along with Coalition Forces (CFs) trained, equipped, and stationed the 505th and 506th ING BNs vicinity of Fallujah. Lieutenant Colonel (LTC) Jubair was the 505th BN CDR, and LTC Sulaiman Hamad Ftikan was the 506th Battalion Commander. LTC Sulaiman worked the closest with CFs and ordered his BN to serve on several operations with CFs. Sulaiman was a Black Belt in Karate and a respected leader. (U) After the four Blackwater Contractors were killed, mutilated and hung in Fallujah on 31 Mar 04, Fallujah became a hotbed for the insurgency in the area. The Fallujah Insurgents openly threatened the ING Soldiers with death if the ING Soldiers wore their CF-supplied ING uniforms around town. Local Imams spoke out against CFs and the new government, calling for CFs to depart and for jihad against the US. Insurgents also threatened the families of the ING soldiers. Insurgent leaders such as Sheik Janabi and Hadid led large insurgent militias of former regime elements in the city. Janabi was one of the most powerful tribal leaders in town. (U) AIFs also used much more serious forms of intimidation and violence against the ING CDRs. AIFs in Fallujah posted fliers around town calling for the murder of LTC Sulaiman in Jul 04. Additionally in July, his bodyguard’s car and house were blown up. The bodyguard was later kidnapped. (U) An elaborate trap was set in Aug 04 to kidnap LTC Sulaiman and Jubair. Janabi and Hadid reportedly sponsored this plot. The Fallujah Bridge and Fallujah Police reportedly participated in the actual kidnapping operation of both CDRs (United Press International (UPI), 15 Aug 04). (U) First, the Fallujah Brigade and Police stopped the car of two officers from the 506th and kidnapped them, taking them to a local mosque. One of the officers was CPT Ali, a fellow tribesman of LTC Sulaiman. This forced LTC Sulaiman to mount a rescue attempt, which failed. While returning to his headquarters after the failed attempt, he was ambushed, but fought through the ambush, making it back to his headquarters (HQs). Upon arrival at his HQs, LTC Sulaiman found it occupied by heavily armed insurgents. (U) Before attempting to retake his HQs, local Imams came to LTC Sulaiman and promised safe passage for him to negotiate for the release of his two officers, including CPT Ali. The Imams also turned over the HQs to 13 of his Soldiers. Sulaiman left with the Imams. This was the trap. (U) Lt. Col. Sulaiman was taken to the High Council of Fallujah; a group of rebel imam’s and sheiks that formed in Jul 04 and had apparently unseated the city council and mayor. LTC Sulaiman was beaten until unrecognizable and beheaded. Reportedly Sulaiman confessed to collaborating and spying for the coalition, among other crimes. A video showing the beheading was circulated around Fallujah (Washington Post, Key General, 12 Sep 04). His body was dumped in front of his old Headquarters on 11 Aug 04. (Analyst Comment: Good IO perception management by AIFs). (U) AIFs also kidnapped LTC Jubair on 9 Aug 04, and he is still missing as of Sep 04. Insurgents beat and urinated on Jubair in public before he disappeared (UPI, 15 Aug 04). (U) LTC Sulaiman‟s security detail of 13 soldiers that were left at his HQs was also overrun on 9 Aug 04, and AIFs stole a fleet of ING trucks and cars, 10 rocket-propelled grenades, 300 AK-47s, machine guns, ammunition, computers, radios and furniture. (U) Janabi and Hadid, most likely ordered these kidnappings to destroy any remaining allegiances in Fallujah to the Baghdad government or to CFs. AIFs are known to have used various intimidation tactics like this beheading video in the past against ISF personnel. Fallujah insurgents have threatened and attacked ING personnel and their families using methods such as kidnappings, shootings, knifings, VBIEDs, IEDs and home invasions to create fear. ING personnel and average citizens are all too aware of the risks of giving allegiance to the Iraqi government during such an active insurgency in key cities in the country. (U) In the end, AIFs used local tribal ties, this video, and other forms of intimidation to compromise the allegiance of ISF personnel in Fallujah that might have remained loyal to the new Iraq. Tribal ties are more important and are often exploited in such cases where an issue involving family, clan, tribe or city is at stake. (U) AIFs‟ IO campaign involved a mass media blitz using the disseminated video of the beheading of the ING Battalion commander. The insurgency is already known to have taped and produced many compact disks of their attack exploits, which are available in country (For example Michael Ware Interview/CNN). (U) The members of the 505th and 506th ING BNs deserted their posts after the kidnappings of their leaders on 9 Aug 04. They deserted taking with them their uniforms and weapons. Fallujah has had a reported desertion rate of over 80% of ISF personnel in the past. I MEF has ordered the replacement BN CDRs of these two BNs to reform their troops by 21 Aug 04. If the Soldiers who deserted do return with their uniforms and weapons, they will be able to rejoin their units. If not, they will be black listed. The new Soldiers who volunteer to serve in these ING BNs will have to be reissued uniforms and weapons. This will be the third time these two units have been reformed and refitted with equipment and weapons after such desertions (UPI, Marines Disband, 15 Aug 04). The new ING BN CDRs are now discussing with CFs the possibility moving their Soldiers and their families to more secure, isolated bases outside the city. (U/FOUO) The former Soldiers of the 505th and 506th ING BNs are clearly under pressure from the local insurgency and their tribes. Some of these personnel have become insurgents themselves and much of the weaponry and equipment that these personnel deserted with has probably fallen into insurgent hands. (U/FOUO) The idea of moving the ING BNs outside of the city is probably the only way to help secure the Soldiers and their families from insurgent attacks and to lessen AIF threats and influences. Deploy approximately 300 or more personnel equipped with 300 AK-47s, 10 RPGs, machine guns, vehicles and radios. Prepare a planned, but not necessarily integrated BN defense (worst case scenario). Prepare tunnel systems to support limited logistics operations in the defense. Conduct complex squad and platoon size attacks and ambushes. Conduct platoon and larger size attacks with very limited complexity, coordination and cohesiveness. Conduct kidnappings, assassinations, and anti-helicopter ambushes (RPG and small arms fire). Lay surface and buried minefields, but these minefields may not be tied together for a coordinated defense. (U/FOUO) Deploying units will see continued reporting on the desertions and disloyalty of personnel serving in the Iraqi Security Forces and the shifting of allegiances of local national employees working for CFs. High desertion rates are evidence that things may not be what they seem. Just because you have daily contact with leaders from ISF units does not mean they support the new government or the CF agenda. They may just need a paycheck. (U/FOUO) Insurgents have observed the deteriorating security situations inside Fallujah, Samarrah, Baghdad and Ramadi and will attempt to create similar conditions in other key cities. Fallujah‟s insurgency will certainly attempt to influence security in Ramadi, the Provincial Capital of Anbar.